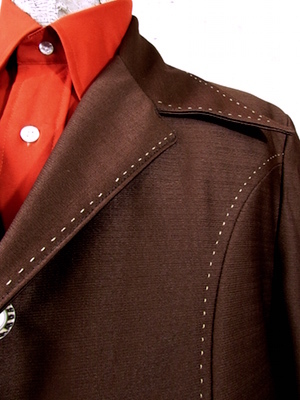 Home > 1970s Disco Clothing > All Disco Clothes > (43) vintage 1970s men's LEISURE JACKET! Chocolate Brown with Caramel Top Stitching! Vintage 1970s men's polyester leisure jacket! 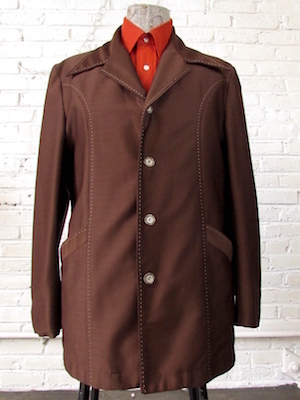 This fantastic jacket comes in a rich chocolate brown with caramel top stitching! This sweet leisure has a super wide disco era collar. Closes in the front with pearly taupe and dark brown buttons with one more on each cuff. The cuffs are styled so they can be worn folded up or straight down. Two deep front pockets on the lower portion of the jacket. Side splits on the bottom of the jacket for a flattering fit. Fully lined in an orange acetate. Chest: 43" LARGE - Tagged a 44" but we are measuring it closer to a 43". Sleeves: 32.5" collar to cuff / 26" shoulder seam to cuff.